Welcome to Q&A session 4! In today’s episode, all five coaches work together to answer 10 subscriber asked questions. 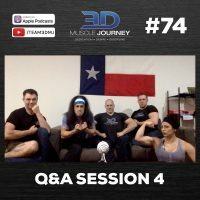 Topics range from: appropriate usage of drop-sets, to manipulating your body-fat set point, eliminating loose skin, maximum recoverable volume, “adrenal fatigue”, and more. To expand your knowledge base and acquire additional resources to aid you in your nutrition and training programming, give this episode a listen!